Old map by BRITISH ADMIRALTY CHART. 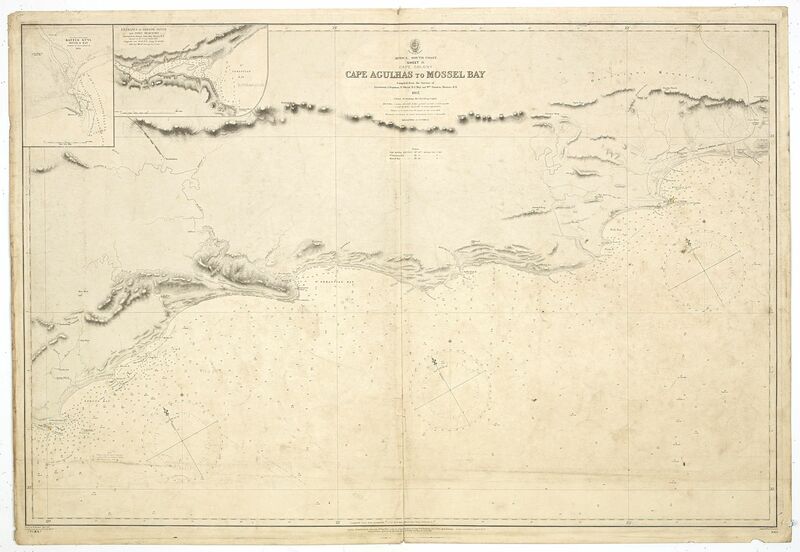 - Africa south coast sheet II Cape Colony Cape Agulhas to Mossel Bay compiled from the surveys of Lieutenant J Dayman 1867. Title: Africa south coast sheet II Cape Colony Cape Agulhas to Mossel Bay compiled from the surveys of Lieutenant J Dayman 1867. Size: 26.0 x 38.6 inches. Condition: Paper age-toned and dusty, a few brown stains, center fold splitting at lower part..
A fine Hydrographic Office chart no. 2083 (2185), showing Cape Agulhas to Mossel Bay. Engraved by E. Standford. London : Published at the Admiralty 16th Sept.r 1867 under the Superintendence of Captn. G.H. 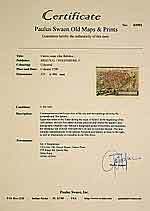 Richards,... Hydrographer : Sold by J.D. Potter agent for the Admiralty charts, 31 Poultry & 11 King Street, Tower Hill". With indication of Magnetic Variation in 1900 and of fixed and flashing lights. Chart with two insets. Insets: 1. Kaffir Kuyl river and bay survey by Lieut Dayman RN 1855 circa 1:35,000, 2. Entrance of Breede River and Port Beaufort surveyed by Daniel John May Master RN 1865.